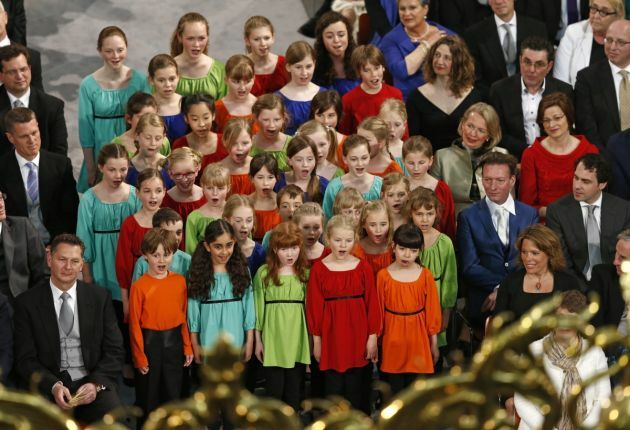 (Photo: REUTERS / Jasper Juinen / POOL)Choir of children sing in the Nieuwe Kerk church of Amsterdam during the religious crowning ceremony April 30, 2013. The Netherlands is celebrating Queen's Day on Tuesday, which also marks the abdication of Queen Beatrix and the investiture of her eldest son Willem-Alexander. Due to concerns that growing numbers of girls are attending class in "too short skirts," a Reformed Protestant school in the Netherlands' Gelderland province now has "dress coaches" to ensure that students wear "appropriate clothing." The letter said girls are supposed to wear skirts and boys trousers with a shirt or jumper and that their clothes must "bear witness to the difference between men and women," the Dutch daily newspaper, Trouw reported. But the letter noted that several girls attended school in miniskirts, which surprised local residents. It also warned that parents of girls who defy the school's clothes policy following a meeting with the "clothing coach" will be invited to the school to discuss the issue, said the report. School authorities however were quick to say that "clothing coaches" should not be regarded as "police." They also said that a mothers' panel has also been created to study the possibility of providing cheap alternatives to miniskirts, stated the letter. Staunch Netherlands Protestant communities have resolute views about the need to wear modest and proper clothing, with women expected to wear long skirts and to cover their heads when they attend church. Some ministers have banned leggings among women. In 2007, Minister W.J op 't Hof of Brabant village of Nederhemert wrote an article in the church magazine reminding his female flock to make sure their skirts were decent. Op 't Hof was quoted as saying, "On biblical grounds, we respect the difference between men and women. And leggings under a skirt are still trousers and therefore only suitable for men."